Part of Adam Hoets’ most recent range of pendants and chandeliers, the Love Clover collection is a whimsical take on the striking similarity between the silhouette of a clover and the shape of a heart. Playing off the folklore of luck that surrounds this petite plant, each of the four distinctive designs in the range conveys the sense of magic associated with finding an elusive four-leaf clover. Founder and Creative Director Adam Hoets was inspired to create the range during a walk in the mountains when he and his wife came across a field of clovers, the beauty and serendipity of this discovery prompting her to suggest Adam form a design around the moment. ‘Since that day, she has encouraged me to use the shape of the four-leaf clover in my work. In a way a tribute to her, the range was initially meant to comprise a single design, but Adam found the motif lent itself to further permutations and expanded it to three pendants and a chandelier. The challenge came in when trying to capture the feeling of joy associated with the memory, while still instilling a sense of sophistication in the designs. Hoets felt each piece had to have a playful name to represent what first inspired it into being. As a result, the fittings bear titles such as Secret Love, Big Love, Baby Love and Lucky Love. The Secret Love pendant is powered by four LED lights and comprises of four tapering segments, each cut to reveal heart patterns from any angle. Big Love is a striking chandelier with four tapering segments that are lit by five halogen or LED lamps in Pyrex balls, with Baby Love translating similar forms into a smaller scale as a pendant with a more delicate glow (courtesy of a single LED lamp). Completing the collection, Lucky Love is the most ‘romantic’ of the range, with more of a floral than a botanical look. 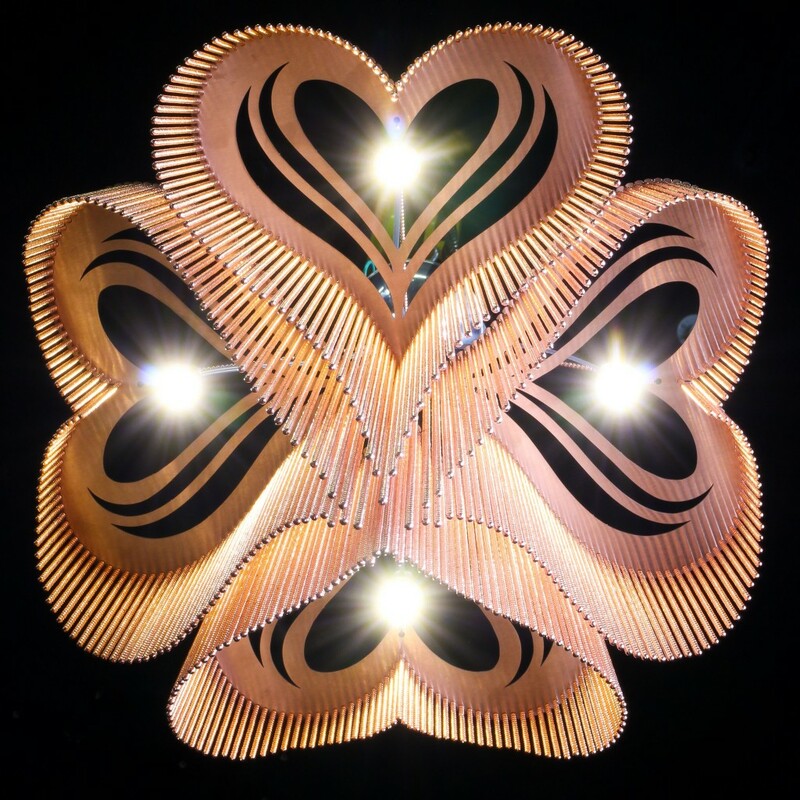 Its four heart-shaped segments bow from a single halogen or LED light to resemble an elongated four-leaf clover cutaway, making this pendant best seen from below. All Love Clover lights are available in a selection of coloured finishes including brass, copper, silver, smoke, rust, white, red, black and mixed metallic. View the range at http://www.willowlamp.com/collections.php. Order via info@willowlamp.com or call +27 (0)21 447 8529.
willowlamp is an award-winning South African lighting company. Founder Adam Hoets uses a unique method that involves fixing ball chains to laser-cut steel frames. A tiny notch in the metal frame creates a chain curtain that is totally free from fasteners. The result of this adaptable and versatile method is huge scope for creativity which has resulted in a vast range of intricate lighting designs, including lamps, pendants, chandeliers and art pieces. Inspired by nature and sacred geometry, Hoets’ designs are masterpieces of both aesthetics and form. Today these works can be seen at a range of sites – including residential, retail, hospitality and commercial establishments. Herman Miller Introduces Cosm, by Studio 7.5!